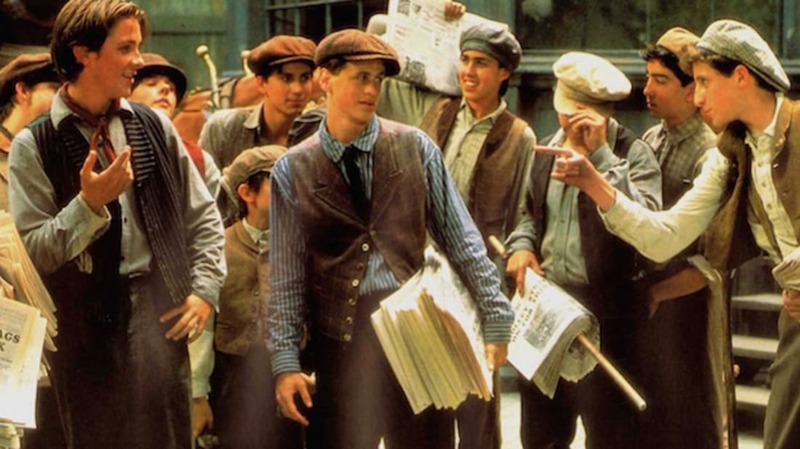 Long before he was Christopher Nolan's Batman, Christian Bale made one of his earliest big-screen performances in Newsies, a musical based on the Newsboys Strike of 1899. Despite being unpopular with critics, and one of the biggest box office failures in Disney's history, the film has developed a huge cult fan base over the years—so much so that Disney decided to adapt the film—which was released 25 years ago today—into a very successful Broadway show almost 20 years after its initial release. 1. CHRISTIAN BALE DIDN'T REALIZE IT WAS A MUSICAL AT FIRST (BECAUSE IT WASN'T). In 1997, Christian Bale told Movieline that he never had any interest in doing a musical. "I still don't. In fact, when I first read the script, I thought it wasn't a musical. Later, after I realized it was, I asked [director] Kenny [Ortega] if maybe I could duck over here into the pub while the numbers were going on, and then come out when it was over. I hoped I could be the lead in a musical without doing any singing and dancing! Eventually I said, 'F**k it, let's just do it.' But I had a lot of doubts about it—I never liked musicals, and even then I knew I'd never do anything like that again." Newsies was originally written as a drama. Disney CEO Jeffrey Katzenberg asked that it be turned into a musical after the success of The Little Mermaid (1989). 2. MILLA JOVOVICH AUDITIONED TO PLAY SARAH. Milla Jovovich didn't get the part, even though she could sing. Her readings with Bale were considered "abrasive." Ele Keats was cast in the role, despite her lack of singing talent (which is why a planned Sarah song was cut). 3. MAX CASELLA DID HIS HOMEWORK. Max Casella, who played Racetrack Higgins, was so excited about starring in his first major motion picture that he "lived" at the Los Angeles Public Library researching the role. Casella, Bale, and the rest of the principal cast of kids spent 10 weeks training in singing, dancing, gymnastics, and martial arts for the musical numbers. 4. BALE'S SISTER PLAYED MEDDA'S ASSISTANT. Louise Bale originally had a song of her own, but she only ended up appearing briefly, grabbing Medda (Ann-Margret) after Racetrack was punched at the riot. 5. ALAN MENKEN COLLABORATED WITH THE CO-WRITER OF TONY BENNETT'S "COPACABANA." To write the music for the film, composer Alan Menken partnered with his old friend, lyricist Jack Feldman. Feldman claimed the two had to write the songs quickly because they had to be pre-recorded. 6. BALE GOT HIS OWN COLORS. Jack purposely stood out in dark colors, contrasting with the other newsies in brown. Bale's character was also the one person with the "touch of red." 7. THE BOYS KEPT PRANKING THEIR DIRECTOR. First-time director Kenny Ortega (who would go on to direct the High School Musical movies) was the victim of multiple water gun attacks. In one incident, some of the cast failed to dump water over Ortega's head as he was leaving the set to go home. To make sure they got their man, Bale and David Moscow (David Jacobs) unleashed a ground assault on their target. Aaron Lohr (Mush) also claimed that Ortega's trailer would be filled up to the ceiling in newspapers, ready to topple whenever Ortega opened it. 8. A 25-MINUTE HORROR MOVIE SPOOF WAS MADE ON SET. Michael Goorjian (Skittery) directed Blood Drips Heavily on Newsies Square. In the film, "Don Knotts" (Mark David, a.k.a. Specs) methodically kills off the newsboys after he doesn't get a part in Newsies. 9. SARAH'S DRESS WAS AN AUTHENTIC OLD DRESS THAT WAS CONSTANTLY ON THE VERGE OF FALLING APART. In the Irving Hall scene, Ele Keats wore an antique dress sent from a New York clothing collector. After each take, the delicate attire's small holes had to be sewn back up. 10. BOOTS GOT LOST IN THE CROWD. 11. FRANCIS FORD COPPOLA WANTED THE SETS WHEN THEY WERE FINISHED. Newsies was the first film to shoot at the reconstructed New York City backlot at Universal Studios, which had been destroyed by a fire that caused $25 million worth of damage in November 1990. Coppola wanted the Newsies set for his upcoming production of Bram Stoker's Dracula (1992). Unfortunately for him, the sets built were Disney's property. Universal Studios ended up charging Disney for anything they took away from the lot, leading Disney to leave most of the work behind, including the World Press building. 12. JOSS WHEDON WAS ONE OF THE FEW PEOPLE TO SEE THE MOVIE IN THE THEATER. "We saw it in the theater, okay?," the creator of Buffy the Vampire Slayer said. "We were among the 10. At that point I was working for Disney. I think the greatest musicals—with the exception of South Park—that have come out of American cinema in the last 10 or 20 years have all been Disney musicals. Menken and [Howard] Ashman were like gods to me, so I went to see Newsies ...There are some songs in there that aren't bad, actually. If you listen to the score, you forget why you hated the film, and then you watch it again and go, 'Oh yeah, right.'" 13. THE FILM EARNED MENKEN HIS ONLY RAZZIE. 14. DISNEY LAUNCHED THE MUSICAL TO COLLECT ON THE ROYALTY FEES OF THE SONGS. At least that's what lyricist Jack Feldman has said. Nearly 20 years after the film's release, Newsies launched as a stage show in New Jersey in 2011, then began a 12-week trial run on Broadway. It ended up running there for two years. Ortega was quoted as saying Disney first realized there was a potential audience when they learned that high schools had been putting together unofficial musical productions of Newsies, without Disney's permission, for years. 15. BALE WON'T SEE THE MUSICAL. "I'm not really into musicals," Bale said in 2012. "But I wish them the best. And I'm sure the person playing the character I played exceeded whatever I did, and congratulations to them." Despite its disappointing performance at the box office, Bale—for one—recognized the passion of Newsies' fans back in 1997, long before Disney did. "You say something bad about Newsies and you have an awful lot of people to answer to," Bale said.